A few days ago I had to yet again cross international borders. While I am a big fan of my passport, the world seems to be less generous about it, operating under the assumption that I will overstay my welcome most places I go. Unfortunate. All of it leading to a series of awkward interactions where I’m asked a lot of questions not because anyone is actually interested in the answers, but probably more because they want to look for contradictions, imprecisions or gaps that would perhaps point to some form of deception, some hole in my argument or my story that merits further probing and analysis. A reverse, dark form of epistemology. It just so happens that I’ve been doing a lot of reading and having a lot of conversations lately around cryptocurrencies — i.e. Bitcoin — and their underlying logical constructs/technologies, such as the blockchain. I refuse to try to explain the blockchain — far more intelligent people than myself have tried with varying levels of success — but suffice to say that a blockchain operates as a distributed transaction ledger. All of the users of a blockchain hold a copy of it, and every time a transaction (of any sort) takes place, it is attached as a new block on the chain and replicated across all existing copies. Different versions of the chain can refer to each other to make sure they have the correct, most up-to-date version of the chain, and because transactions are cryptographically signed, chained blocks can be validated to ensure no tampering or corruption is taking place in the replication process. Picture of a blockchain in the wild. So I did end up having to explain a little bit of it. Anyways, the blockchain model is most famous for first being described in Satoshi Nakamoto’s original whitepaper outlining the concept for Bitcoin, the cryptocurrency gaining a lot of momentum and attention lately. Its appeal relies on both its security features and its capacity to sustain a significant volume of transactions across globally distributed networks without requiring centralised facilities, servers or databases doing the upkeep. While it’s true that Bitcoin does require mining nodes —which don’t actually do any mining, mind you, but are rather just computers dedicated to the task of verifying and validating transaction in exchange for Bitcoin payouts — this is but one possible implementation of a blockchain, and the earliest one at that. There’s a lot of potential and opportunity in experimenting with different forms of blockchain-based applications which would benefit from secure, signed, globally-distributed transaction ledgers. Which leads me back to my border crossing. Passports are both a form of identification and a form of authentication. They’re a form of publicly announcing who you are in a format that’s almost universally acknowledged, but they’re also a medium for determining whether you should be granted access to a geographical location —either because you’re inherently allowed to enter (i.e. because you’re a national of said geographical location) or because you have the right credentials to do so (i.e. a visa or a corresponding waiver). Both these functions are a result of government-backed transactions: the issuing of a passport certifying it corresponds to the biological and legal entity that is you, and the issuing of visas and credentials by various governments certifying that the holder of said passport, inasmuch as they can be determined to be the corresponding biological and legal entity, should be granted access to its territory (or at the least, not impeded access as a default). This is all very fascinating, really, but the system is quite a mess. Different governments have different requirements and procedures to grant access credentials, often applied inconsistenly around the world, and even when credentials are granted they still need to be revalidated at ports of entry and other checkpoints for their authenticity. That you’ve been to a place before and have complied with all its laws and regulations is no real indicator that you’ll be able to go back or that you should be able to access any other territory, and migratory transactions often feel as starting from scratch many times over. 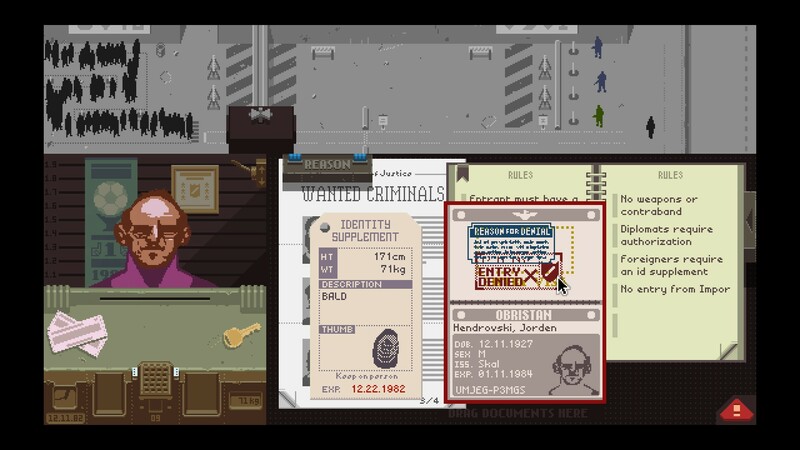 The indie game Papers, Please is a fascinating illustration/exploration of the logics of border crossings and immigration checkpoints. How could a blockchain make things different? We can imagine a cryptographically-signed passport(1) associated to an individual, operating roughly as a Bitcoin address would: properties and values can be assigned to this address through transactions that are validated because they are digitally signed by authorised parties, and these properties and values can in turn be read and verified by other authorised parties. In other words: access credentials such as visas, permits, or visa waivers can be issued as transactions broadcast across a network of nodes which hold information for millions of people. These credentials are attached to specific passport identifiers for each person, creating a master record of where you can and can’t go. But then where you actually do go can also be registered as a similar transaction, within a distributed migratory record: every time you’re granted access to a territory, a new transaction associates said entry to your passport identifier in the blockchain. This transactional history can then be available to authorised parties when determining future access credentials: rather than having to produce and present migratory history documents and all sorts of personal papers when applying for a visa at any given consulate, officials can just execute a query on the blockchain to assess a person’s migratory profile and determine their eligibility for access credentials. These, in turn, can be immediately attached to the passport identifier by broadcasting a transaction to the network. By now you’re probably thinking how this would be a privacy and human rights nightmare: having your entire migratory history available publicly to a distributed network of nodes around the world? Are you insane? Well, only partially. On the one hand, we need to remember that this information is already being collected at multiple points, albeit inefficiently and not putting it at the service of citizens(2). On the other hand, we need to be mindful of the encrypted nature of the blockchain and its foundation on public cryptography: all transactions are public, but the content of said transactions can only be decrypted by having the right access credentials — the private keys to the kingdom — that turn random strings of characters into words and values. This means that only authorised parties would be able to sign and validate transactions, or otherwise to read and validate them. Having everything hiding in plain sight could even enable additional security benefits for citizens: by having the blockchain be publicly available, users could have additional controls on who gets to access their information, in what contexts and for what purposes, and they could also be provided with visibility into who is trying to access their data. Altogether, there’s the potential to create a system that could be significantly more transparent and accessible than the one currently in place today. There are perhaps a million downsides to what I’ve just described. Nonetheless, models such as that of the blockchain are an invitation to reimagine large-scale transactional systems that we’ve naturalised the way they are and we shouldn’t just accept at face value. There’s the opportunity to create new systems that facilitate daily transactions for millions of people in a way that’s secure, transparent, and accessible, and that could shed light and bring a stop to multiple forms of abuse happening at multiple checkpoints around the world. (1) Unsurprisingly I’m not the first person to have thought about this. Cf. Chris Ellis’s World Citizenship project attempting to create a cryptographicaly-signed passport. (2) It is also worth pointing out that this entire mess of a system is invisible to a lot of people. If you have the right passport, border crossings might be a hassle and an annoyance, but hardly a violation of your privacy and intimacy. There’s a very specific outlook on global citizenship that comes from having to visit consulates multiple times over carrying all sorts of personal documentation to be granted permission to visit a country. Playing with digital stuff at @lavictorialab / making tudu.pe happen. Previously: researching video games @mit_cmsw.